How can orthotics relieve my foot pain? There are certain foot types such as flat feet or high arch feet that can cause pain. In addition, heel pain can arise from repeated tearing of the plantar fascia or the Achilles tendon. To relieve the pain, many podiatrists recommend wearing orthotics as a conservative treatment option. Orthotics are a functional device, constructed for the sole purpose of correcting and optimizing the function of the foot. They work by realigning your feet and ankles. Further, they help to distribute your weight more evenly, easing pressure on areas such as your heel or the ball of the foot. They are also useful for improving muscle positioning and performance. Orthotics can be an effective part of your treatment plan, and may even prolong or eliminate the need for surgery. Orthotics can be purchased over the counter or can be custom made to fit your feet. For some mild conditions such as moderate heel pain or ball of the foot pain, over the counter orthotics such as gel inserts may be sufficient to cushion the foot and thus relieve pressure and pain. However, if over the counter orthotics are not providing relief, custom orthotics could be the answer for you. Our Marietta Podiatrist, Dr. Fui Dawson, can perform an evaluation and custom design the right orthotics for you. Why would one need custom orthotics? Custom orthotics can ease your pain when foot problems negatively impact balance, function or gait. Common problems addressed by custom orthotics include back pain, flat feet, heel spurs, Morton’s neuroma, severe heel pain, ball of the foot pain, high arch feet and Achilles tendonitis. Remember that every foot, like every person, is unique. The value of custom orthotics is that they reject the one size fits all approach. In addition, custom orthotics can be made to fit different types of shoes including dress shoes, sneakers, wedges and high heels. They can also be made in different finishes such as suede and leather. Our Marietta podiatrist, Dr. Fui Dawson, can work with you to design your orthotics with your unique profile in mind. Your consultation will include an evaluation of your foot, your gait, how you stand, x-rays of the foot, as well as any pain or complications you may be experiencing. Dr. Fui Dawson will then use this information to customize your orthotics. Note that you have to wear custom orthotics for a period of time before they fully conform to your feet. Dr. Fui Dawson also advises that you have your orthotics with you when you shop for shoes as orthotics take up space for which you may not have accounted. We recommend that you continue to wear your orthotics even when your feet and ankles feel better unless our Marietta podiatrist advises otherwise. 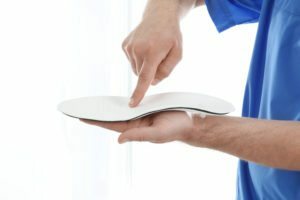 If you are suffering from foot pain and are considering orthotics, our Marietta Podiatrist, Dr. Fui Dawson, can recommend and design a product that is perfect for your unique needs. Contact us today or book an appointment online. Don’t Allow Heel Pain To Slow You Down! Symptoms of heel pain may range from sharp shooting pain to heel discomfort. In some cases the heel pain may be described as a tingling, burning or numbing sensation. Very often, the culprit of the heel pain may be some internal derangement of the bone such as a heel spur,a tight ligament, swelling within the bone or a stress fracture. Pinched nerves in the ankle may also manifest as heel pain associated with tingling, burning and numbness of the heel and/or parts of the foot. Pinched nerve roots in the lower back may also affect the foot along with parts of the leg and thigh resulting in altered sensation and muscle function. In these cases, proper physical examination and appropriate diagnostic testing may be needed to determine the source of the problem. Treatment for heel pain may include but not limited to activity modification, shoe modification, icing, medications, physical therapy, rigid orthotics, selective injections with steroids or surgical decompression of the pinched nerves. A qualified podiatrist will be able to direct you towards proper treatment. Call us if you are dealing with heel pain and we will be happy to help!